Roving reporter Keith Robinson has discovered a splendid little museum hidden away in the Army’s traditional west Surrey home. The Royal Logistic Corps is a new formation, and its museum is housed appropriately in a new building on the campus of Princess Royal Barracks, close to Camberley and Aldershot, the Army’s traditional home in leafy Surrey. The RLC came into being in 1993, having been formed from the amalgamation of the Royal Corps of Transport, Royal Army Ordnance Corps, Royal Pioneer Corps, Army Catering Corps, and the Postal and Courier Section of the Royal Engineers. The museum itself was founded shortly after, in 1995, but has already had a revamp, in 2003, and in fact one or two displays are undergoing further change. There are plans afoot to add a WWI trench display as well. Although a relatively small building, it manages to pack a lot of objects and information into the available space. Modern design and display panels, with plenty of room to get around, make the museum a bright, cheerful, and pleasant place in which to while away an hour or two. Although the Corps is new, the forming corps can trace their activity back to the 13th century – but most of the artefacts come, as you would expect, from the 19th and 20th centuries. Entering the displays below the title, ‘Life Blood of War: Logistics through the Ages’, you are presented with a chronologically organised series of visual panels showing aspects of supplying fighting troops through time. Inserted in these panels is a neat set of small cases of objects from the relevant time period; a neat, informative, and colourful display. Free-standing in the centre of this area is a Soyer Stove. Alexis Soyer, a French chef, concerned about the welfare of soldiers during the Crimean War (1853-1856), developed a portable cooking-stove. Not only was it fuel-efficient and able to cook large quantities, but was also very versatile, being able to bake, roast, steam, and boil food. The better diet the Soyer Stove provided was claimed by a contemporary edition of the Morning Chronicle to have saved as many lives as the improvements in medical care introduced by Florence Nightingale. Made of iron and weighing around 90lbs, two of these stoves could be carried by a mule. So successful was the design that a few still remained in use with the Army as late as 1982. These last few were en route to the Falklands aboard the Atlantic Conveyor when the ship was sunk. Opposite the introductory panels are a series of more traditional display-cases, covering various themes from 1857 up to the First World War, all clearly presented with useful additional information sheets. The first cabinet deals with the Army’s Military Train, formed out of the Royal Waggoners at the end of the Crimean War, when it was realised that the movement of men and materiel needed a more professional approach. Included is a rather nice sealed pattern-jacket of a Military Train private. The Military Train, however, were not mere wagondrivers, but real soldiers. They especially distinguished themselves during the Indian Mutiny (1857-1859). The 2nd Battalion, on their way toChina, was diverted to India and used as light infantry, helping in the Relief of Lucknow. During the campaign, two members of the MT, Farrier Michael Murphy and Private Samuel Morley, were awarded the VC. 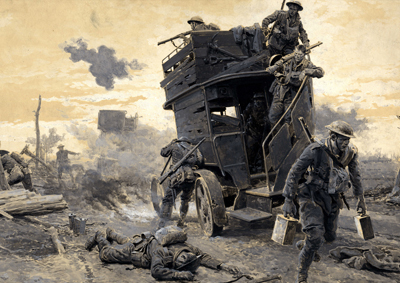 The RLC used any means of transport they could, including the old omnibus depicted in this WW1 illustration. Re-organisation was undertaken in 1869. Supply and transport duties were now officered by a new Control Department, while other ranks became the Army Service Corps. The Control Department later subdivided between the Commissariat Department and the Ordnance Store Department. It was during this period that members of the Corps took part in the heroic defence of Rorke’s Drift in 1879. James Dalton, Acting Assistant Commissary, won the VC, and Second Corporal Francis Attwood, ASC, won the DCM. 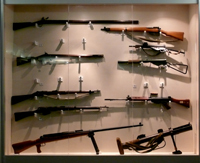 A 0.45 Martini-Henry rifle, the standard infantry weapon during the Zulu Wars, accompanies this section. The museum also houses several dioramas, including one of an ASC workshop, complete with a Douglas Solo motorbike (on loan from the RAF Museum, Hendon). Another diorama provides us with a reminder of the role that horses have played in military transportation even up to the Second World War. 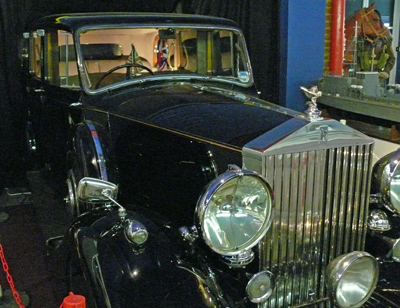 The pride of the collection, however, must be Field- Marshal Montogmery’s 1939 Rolls-Royce Merlin, FLD 99. Monty used this as his staff car during 1944-1945, and arriving onJunoBeachduring the Normandy Landings, it was the first civilian vehicle to go ashore. A reconstruction of the Forward Operating Base Campbell, part of Operation Herrick in Afghanistan, brings the museum’s displays bang up to date. A lot of interest, packed into a relatively small space.